My mum has an interesting name – Zenda. Well, that’s her Christian name at least. I should point out up front that for several generations back the family was born in Australia and for the period before that, most were from the United Kingdom somewhere. My sister and brother-in-law have done a fair bit of research in this area. We’ve always wondered where the name Zenda came from. The obvious place is from the Prisoner of Zenda, ((and yes, my father used to get teased from time-to-time about being the Prisoner of Zenda)) the novel written in 1894 by Anthony Hope Hawkins set in that mythical European country of Ruritania. However that never felt like a likely story. My grandmother reading the book and naming my mother after the book’s title did not seem appropriate. There were also several cinema films made of the Prisoner of Zenda, in particular silent films in 1913 and 1915, another film in 1922 (not sure if that was silent or not), the 1937 version starring Ronald Colman, Douglas Fairbanks Jr, a young David Niven and Mary Astor with Madeleine Carroll being the main female lead. Any movie with Ronald Colman would be a nice romantic choice but alas this movie was too late. Zenda also appears to be a German name, or at least German family name. I cannot see my grandmother selecting it for that reason. Then I came across a US Navy vessel – the USS Zenda. Not a big boat certainly but it was impressed into the US Navy around about the right sort of time. The boat was originally built in 1912 and commissioned into the US Navy on 13 June 1917. She served with the US Navy until being struck on 30 January 1919. The armament was heavy, she was armed with a Lewis Gun. 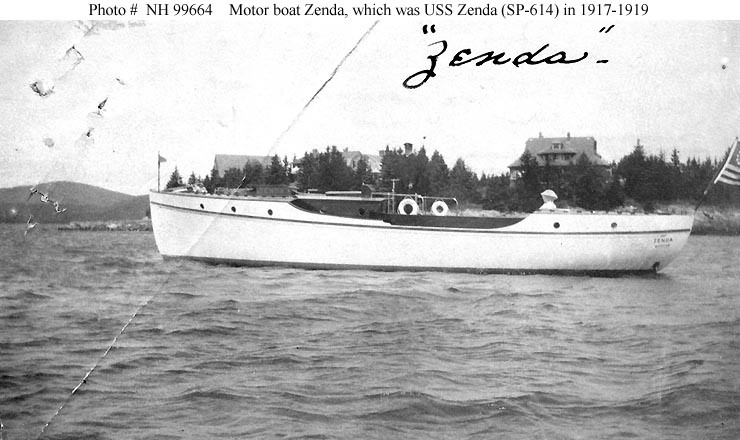 Interestingly the private owner had named her Zenda and the US Navy kept the same name. The boat was about 15 metres long (48′) and had a crew of 6 and was used in US waters. So, I like to think now that my mother’s name is the result of a US Navy sailor visiting Australia or New Zealand around 1919 or so, when my grandmother was 19 years old and seeing my grandmother at the theatre when she was performing. I can picture him then meeting my grandmother and then my grandmother remembering that he served on the Zenda so when along came Mum, that was the name Nan decided. There, doesn’t that sound a much better way for how Mum got her name than just my grandmother read a book? So an over-paid over-sexed over-here Yank had something to do with the DNA of the good Mr Thomo, is that what you’re saying? Big fella, you make the silk stockings worth it. Sorry to cast nasturtiums on your provenance, but hey, that’s how I read it…! I’d stick with the book story. BTW – My father’s middle name is Victor and he was born in mid/late (not sure) 1919. An Armistice Day baby?